Sometimes when you’re camping, you just need a little bit more warmth. Whether your cold weather mummy bag needs a little more heat or you like to sleep with a light covering at night, the best sleeping bag liner is just what you need. We researched the best brands and top-rated products and put together this buying guide to help. Before we get started, let’s take a look at some of the key things you need to know. Material: Some of these liners are made of warm fleece and plush microfiber while others are either satiny polyester or cotton. They’re all durable and machine washable but remember that different fabrics are better for different seasons. Season: Warmer materials are great for winter. Using them inside a cold weather sleeping bag can add up to 15 extra degrees of warmth. Thinner liners that are silky or made of thin cotton are perfect for warmer nights. Zippered: Zippered bags easy to get in and out of but there are some downsides. They can get stuck or snag the fabric and, if you unzip them to get out of your bag, you lose a lot of the heat. Carrying Pouch: All but one of our picks comes with a convenient carrying pouch. This is really the easiest way to travel with these liners. They’re small and can easily be tucked into or attached to your pack. Size: This is how big the liner is when it’s folded for use inside a sleeping bag. Some of these fold up impressively small to be tucked into the carrying bag so we included some of those measurements in the reviews, too. Warranty: These warranties vary a lot from product to product. While there was no warranty information provided for a lot of these liners, others have warranties that last 90 days, 5 years, or even up to a lifetime. Now that you know what to look for, let’s move into the next part of our guide, the product reviews. Here’s the deal, we put our top and budget picks right at the top of our list. That way, if you’re in a hurry, you’ll get a good idea about the range that’s available. Keep reading until the end if you can, all of these products are worth checking out. Ready to get started? Let’s go! 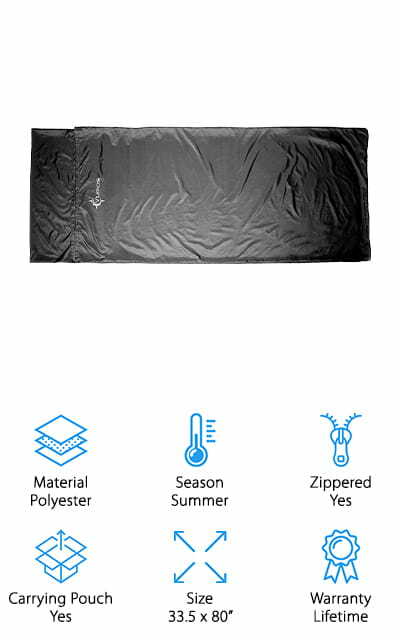 If you’re looking for the best sleeping bag liner for cold weather, our top pick is an excellent choice. The Coleman Stratus Sleeping Bag adds 12 degrees of warmth to your current sleeping bag. It’s made of low-profile fleece that’s soft and comfortable and can even be used on its own in warmer weather. In fact, on its own, it can be used to keep you warm in temperatures as low as 50 degrees. One of the cool things about this one is that is has a two-way zipper system that prevents the fabric from getting snagged so you can avoid the frustration of a stuck zipper in the middle of your camping trip. It also has an elastic storage strap and a storage bag for easy packing and transport. For a cheap sleeping bag liner that’s still really effective, take a look at our budget pick, the Osage River Sleeping Bag Liner. 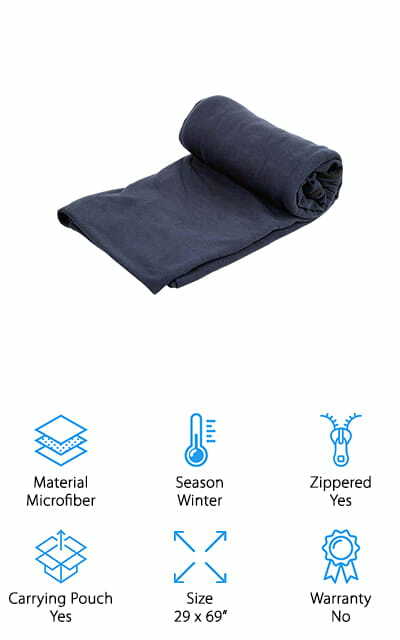 The microfiber material is super soft and comfortable and rated on its own for temperatures of 55 degrees and adds an extra 10 degrees of warmth to your cold weather sleeping bag. It also comes with a handy storage bag that makes packing and storage really easy. That said, you might not want to store it at all. 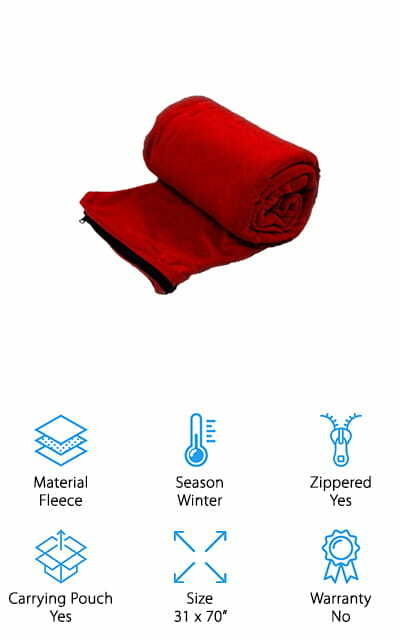 When unzipped, it’s 31 x 70” size makes a perfect blanket to snuggle up with on the couch or a perfect extra blanket when your kids need extra warmth to sleep comfortably during the winter. That’s not all, it’s even available in 3 different colors: red, grey, and navy blue. 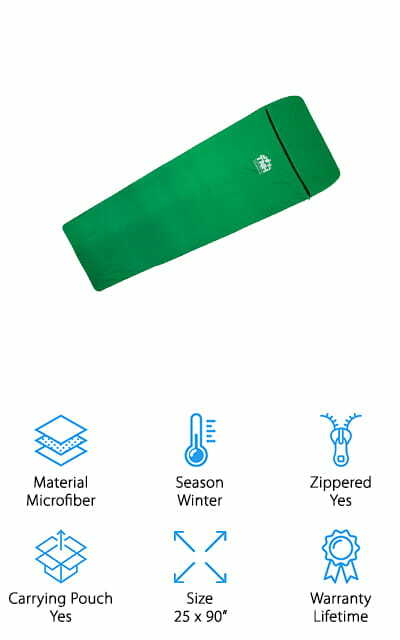 Next up is the Sea to Summit Thermolite Liner, a warm sleeping bag liner that’s made of 100% polyester and can add up to 15 degrees of extra warmth to your existing sleeping bag. The material is lighter and less dense than fleece. What does that mean for you? It rolls up smaller than a typical fleece liner, takes up less space when packing up your gear, and only weighs 9 ounces making it a really great choice for backpacking. Believe it or not, when placed into the carrying bag, it’s only 3 x 5” because it’s so compressible. The carrying bag has a drawcord closure and cord lock to keep it snugly packed away. It’s also specially shaped for use with mummy-style sleeping bags and can be used on its own in warmer weather. This fleece sleeping bag liner from b.m.c is called the Bundle Monster. Use this as a liner for your cold-weather sleeping bag and it adds an extra 10 degrees of warmth. It also makes a great lightweight bag on its own and can keep you warm in temperatures as low as 55 degrees. It has a cool design that makes it really versatile. Zip the ¾ side zipper to use as a mummy sleeping liner, leave it completely open to use as a warm blanket, or zip two together to make a 2 person sleeping bag or extra thick blanket. 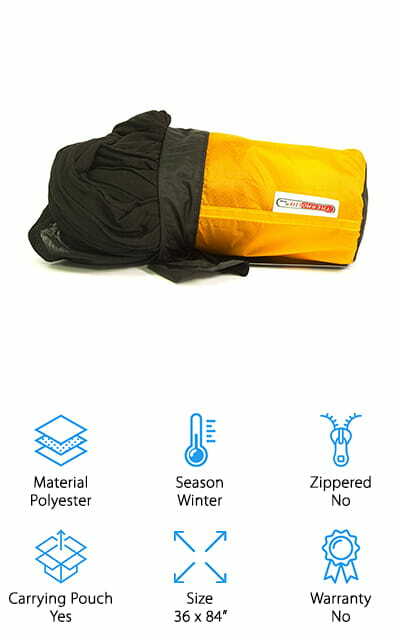 This is a great choice for keeping warm during cold weather camping but is also a great way to keep warm at home or if you’re traveling out of the country and taking advantage of hostels. Next up is a lightweight sheet and sleeping bag liner that’s one of the best options for warm weather. 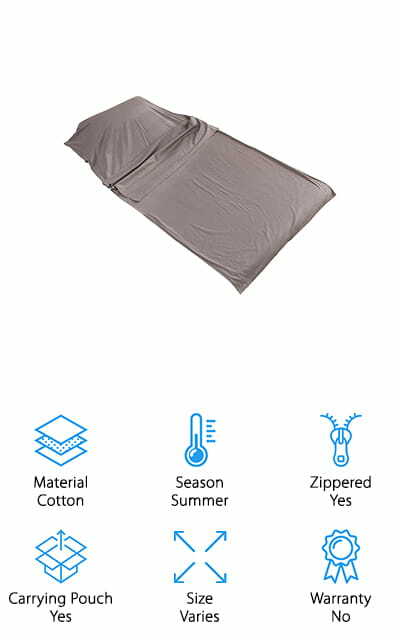 The Outry Travel and Camping Sheet is made of lightweight cotton and is available in 7 different colors. 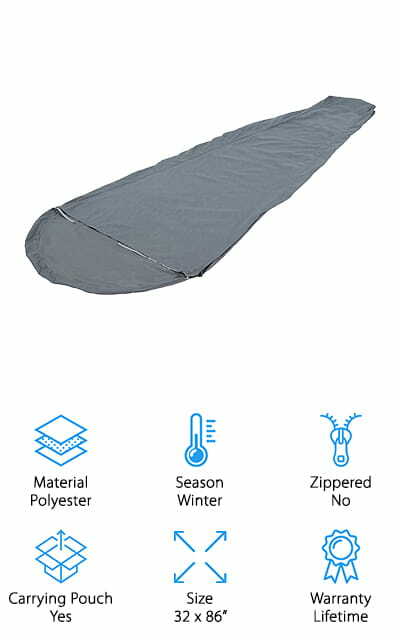 It opens into a wide sheet large enough for two people to use but can be zipped and clipped into the perfect lightweight sleeping bag for one. There’s a pouch where you can insert your pillow, too, which is nice when camping because it keeps everything all together and very neat. Plus, your pillow gets an extra layer of protection from the dirt. The included travel bag is ideal for travel. And here’s the kicker, it comes in 3 different sizes: small (31.5 x 82.7”), medium (45.3 x 82.7”), and large (71 x 82.7”). 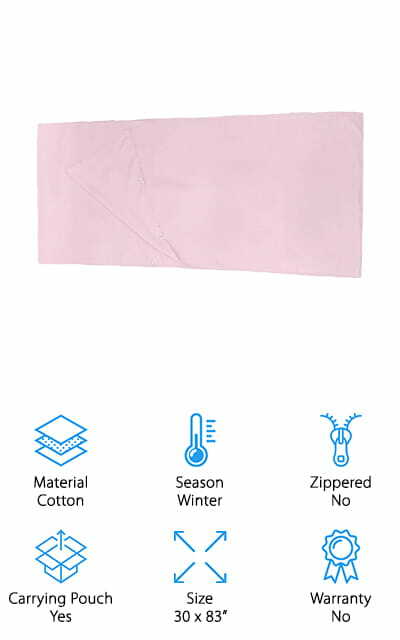 This sleeping bag liner with zipper from ALPS is a great choice for cold-weather camping. 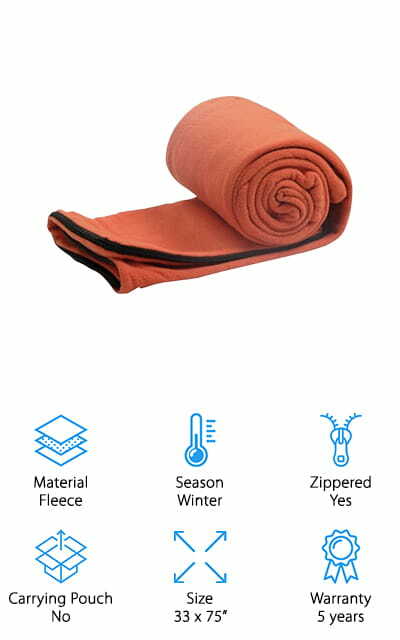 It can add 10 degrees to your cold-weather sleeping bag and you can use it on its own in weather as cold as 55 degrees. Because it doesn’t have a zipper, there are fewer opportunities for heat to escape from inside the bag. It’s also the perfect shape for a mummy style sleeping bag and includes a stuff sack for easy storage and travel. The brushed polyester fabric is soft and really comfortable. It also protects the inside of your sleeping bag from getting too dirty and is even machine washable. It’s really warm without adding a lot of bulk and only weighs 11 ounces, making it great for backpacking. That’s not all, this liner even comes with a lifetime guarantee. Dimples Excel Sleeping Bag is a super comfortable, luxurious choice and it’s the best silk sleeping bag liner we came across in our research. It has an anti-snag zipper with smooth teeth that’s easy to get in and out of. It’s 100% polyester with a smooth, silky finish that adds something special to your sleeping bag. Not only does it keep you warm and the inside of your sleeping bag clean, it also feels like you’re sleeping on expensive silk sheets. Another great thing about this liner is that it’s super long. With 86 inches in length, it gives you a lot of legroom and is great for people who are very tall. It comes with a travel pouch and actually folds up as small as 2.7 x 6.3” and weighs only 8.35 ounces. Next up in our sleeping bag liner reviews is this microfiber liner by TNH Outdoors. This liner has a full length zipper that makes it really easy to get into and requires less adjusting. It’s a heavy duty zipper that won’t break or snag the fabric. The mummy shape is perfect if you’re looking for something that fits nicely inside your cold weather sleeping bag. When zipped, it’s over 7 feet long from head to toe. That’s not all, it adds about 5 to 10 degrees of warmth, too. It’s great for travel and backpacking because it folds up compactly and fits into the included carrying pouch. It weighs only 8 ounces and, at its smallest, is 4.7 x 7.8”, a perfect size to take with you just about anywhere. 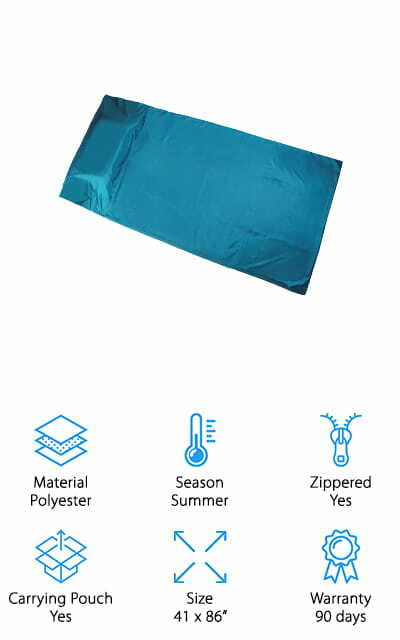 For the best sleeping bag liner for sale that’s great for the summertime, check out this one from Vumos. It has a full length zipper that runs down one side of the liner and along the bottom. Unzip it so it’s flat and you can use it as a nice, large sheet. It’s more than 7 feet long, too, so it has more than enough room for very tall people or can be used as a base sheet for 2 campers. It’s made of 100% polyester with a satin-like finish that’s soft, smooth, and breathable. This is a good choice for hiking or backpacking trips because it includes a stuff sack and folds to only 7.5” long. Also, it only weighs 11.5 ounces so you’ll definitely be able to easily slide it into your pack. Forbidden Road has the last in our sleeping bag liner buying guide. It comes in 2 sizes, medium (30 x 83”) and large (70 x 83”). This liner is made of soft, comfortable fabric that’s machine washable and quite durable. One unique thing about this liner is the elastic belt closure. Rather than using a zipper which can get snagged or Velcro that can get caught in your hair, the small elastic belt closures allow for easy access because they have a little bit of stretch but stay securely closed. This liner also has a pocket for your favorite pillow, too, so you can keep it clean but still be as comfortable as possible. Both sides fold down so they’re portable and convenient for travel. This liner is also available in 6 different bright colors.